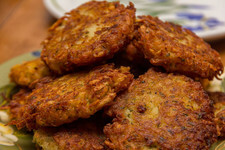 We get the sense that latkes tend to fall into the category of "foods people usually make and eat at home" -- in part because it's a holiday thing for a lot of people. But there's gotta be a place in the Capital Region that Xina get score some good not-made-at-home latkes. Or maybe you can share some advice on how she can make good ones at home. Try Gershon's in Schenectady, Saatti in Newton Plaza, or I -Hop. If you don't mind re-heating, I am pretty sure that I recently saw some in the pre-boxed prepared foods section in Whole Foods. Didn't indulge myself, but the prepared foods section usually churns out pretty tasty items. Unfortunatly I think that Nosh is closed. Muza's in Troy has great potato pancakes. I've just got latkes from Whole Foods. They were pretty good. Latkefest is an annual tradition in my family so every year we make a lot of latkes. We have really improved our latke making skills over the past few years since we found the recipe below. Two tips-- make sure the oil is hot enough and as mentioned above, get the water out of the shredded potatoes. I use dishtowels to squeeze mine in. We save the liquid and wait for the starch to settle and mix it back in so they hold together better. It's definitely more work than what we used to make, but the results are outstanding! Thanks! Gershon's is advertising they've got latkes, so I'm going to give them a try. Kosher Chopper (near 155/5 in Colonie) has them in their deli. I'd expect the turnover to be good at that location. I've heard good things about the frozen ones from TJs. Making them isn't super hard, but require some patience. Squeeze the extra liquid out of the potatoes before you mix with egg and a binder like flour, matzo meal or even corn starch if you are GF. Add salt to the "batter" before cooking. And keep open eye on the temperature of your oil. Overloading a pot will drop the temp rapidly and you will have tiny shreds floating around like a snow storm. Tasty, but a mess. If you dont want to deal with grating and draining the potatoes, buy the shredded potatoes that come frozen in a bag. Follow the above recipe; if you don't have matzo meal, use flour and I used chopped argula in place of chives. The ones I got from Gershon's were very good. I enjoyed them immensely and appreciated not having to make them. Wolff's Biergarten in Albany has potato pancakes on the menu and they're pretty darn good. I'm guessing the Schenectady one has a similar menu, too.